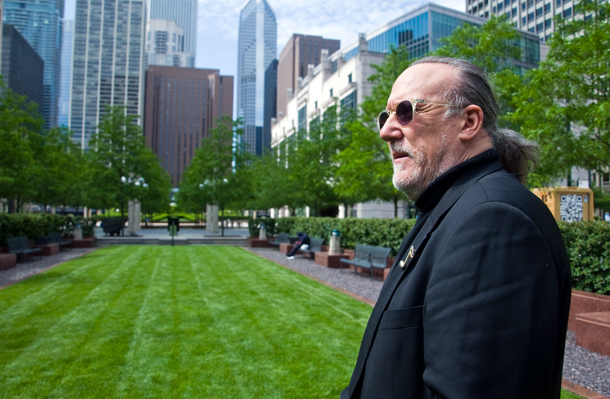 Landscape architect Bernie Jacobs at Cityfront Plaza on North St. Clair Street, the first project in which his firm Jacobs/Ryan employed biochar. 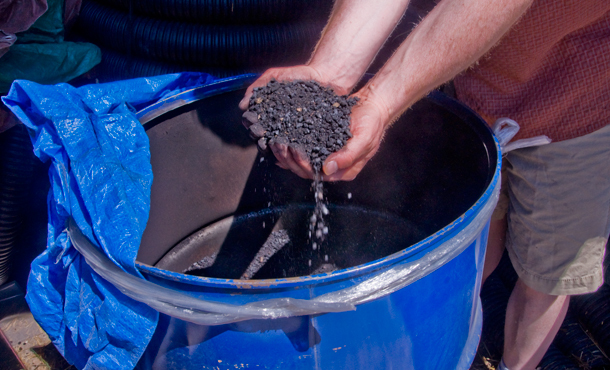 Mark Moxley sifts through biochar at Lake Street Supply. The honey locust trees that span North St. Clair Street next to downtown’s NBC tower may owe some of their girth to a 2,000-year-old agricultural practice from the Amazon. In 2011 landscape architect Bernie Jacobs of Jacobs/Ryan Associates, the site’s designers, had recently learned about biochar — a rich, charcoal-black fertilizer made by pyrolysis, or burning without oxygen. Deep in the heart of a burning brush pile, for example, extreme heat separates organic matter into liquids, gas and a solid called biochar. Because there is no oxygen, however, the process creates no carbon dioxide. Instead, biochar traps carbon. In the first year the honey locusts grew 24 inches, or about twice what Jacobs expected. Two years later, “They have continued to grow like frickin’ weeds,” he said. Urban soils often lack carbon and struggle to sustain the diverse microbial communities that are essential to plant growth. Essentially charcoal, biochar is loaded with carbon and fosters microorganisms so well that it has been called a coral reef for soil. Jacobs is quick to note that every site is different, and that his project isn’t a scientific study. But the cost difference is negligible, he said, and “something is making those trees grow better.” He now uses biochar in most of his downtown landscaping projects, as well as in his own garden. The potent fertilizer works best as an additive. Jacobs’ project on St. Clair used a soil mix that contains about 5 percent biochar. He gets it from West Loop&apos;s Lake Street Supply. Mark Moxley, managing partner at Lake Street Supply, gets the biochar from a farmer downstate, who he said has a trailer-sized pyrolizer. Moxley said he’d like to get his own 5,000 square foot pyrolizer. The heat from such a device, which is essentially a large oven, could heat Lake Street Supply during the winter. Lake Street Supply has no problem selling out of biochar, Moxley said, for which they break even by charging about $2 per pound. Biochar can be made from any organic matter — brush, corn, wood chips, wood pellets — but, Moxley said, “It needs to be done in a thoughtful way.” Using wood pellets could be risky, he said, if the lumber is treated with toxic chemicals. The kind of charcoal used for grilling is generally produced at lower temperatures, which leads to impurities. Biochar&apos;s potential for carbon storage has some touting it as a tool in the fight against climate change. Stover, or leftover plant waste like corn husks and stalks, decomposes after about five years in soil, but carbon could remain sequestered much longer in the form of biochar. Recent research in the journal Science, however, found rain dissolves much more of that trapped carbon than previously thought, perhaps scaling back its environmental benefits. For Moxley and Jacobs, who both use the carbon-rich soil in their backyard gardens, biochar’s positive effect on plant health is reason enough to use the stuff. Bartlett Tree Experts are in the midst of a multi-year study comparing the effects of biochar on urban trees in Chicago.